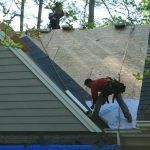 In the Northeastern region of the United States it is standard, even building code, to have some type of leak barrier or ice and water shield on the roof deck before shingles are installed. Due to the amount of ice damming that occurs there is a much higher chance of water damage to occur due to the melting of the under portion of that ice seeping under the first course of shingles and causing rotten wood. Ice and water shield is also a requirement with shingle manufacturers on low slope application of shingles from a 4/12 pitch down to a 2/12 pitch. The old standard of doubling the felt paper is still acceptable but when you’re looking at pooling water that doesn’t shed as fast with gravity, the last place you may want that water to settle is on paper dipped in asphalt. The best choice is a true water proofing underlayment that self seals like ice and water shield does. There are many choices in names such as GAF’s Weather Watch and CertainTeed’s Winter Guard but at the end of the day they all serve the same purpose, to protect a low slope roof deck from water intrusion. Though in the Southeastern region of the United States we may not have ice damming, we do have an accumulation of pine straw and debris from trees. As this debris builds up in valley’s it will create a damming effect just like ice and cause a heavy rain to back up under the shingles. Ice and water shield is by far the best thing you can have in all valley’s, around all vent pipes, skylights and chimney’s. 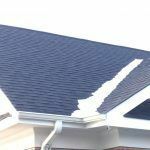 Since it is not required, most roofers will not use it because of the added expense. However, at the end of the day, the best choice for everyone is the choice to use a water proofing underlayment or leak barrier such as ice and water shield in all roofing penetrations and vulnerable areas.